Robometricschool. 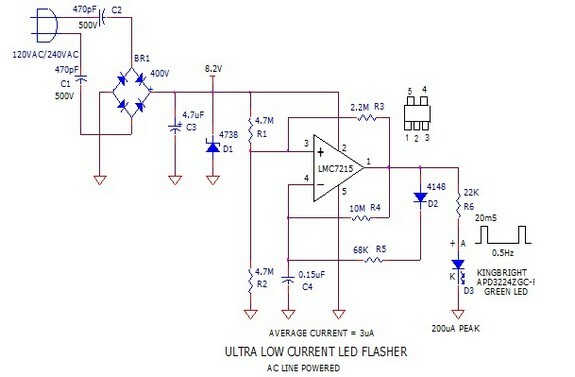 - This is circuit schematic of Circuit Schematic AC Line Powered LED Flasher using LMC7215 IC like in Figure 1 below. With this article we will give you global description about this electronic circuit schematic and also some component parts of this AC Line Powered LED Flasher using LMC7215 IC. Electronic circuit schematic like in Figure 1 above is Circuit Schematic AC Line Powered LED Flasher using LMC7215 IC. According Discovercircuits site describe that some of the latest LEDs are amazing. They can produce a surprising amount of light with very little current. In the light flasher application shown below I take advantage of a nice surface mounted LED from King Bright. This flasher circuit draws only about 3ua of average current from the AC power line to flash this green LED. This flasher might be used as a power indicator light. The circuit taps a bit of power from the AC line using two 470pF capacitors. A bridge rectifier, filter capacitor and a zener diode form a 8v DC supply. That DC voltage feeds a pulse generator set for a 20ms pulse, running at a frequency of about 0.5Hz. It uses a very low power LMC7215 voltage comparator from National Semiconductor. R3 sets the pulse rate. R6 sets the peak LED current at about 200ua. For more information about Circuit Schematic AC Line Powered LED Flasher using LMC7215 IC you can read more from the original source using link here.